The Westmatic HYBRID is a specialized large vehicle wash system specifically designed for fleets of mixed vehicles. The system is a COMPACT 2-Brush or 4-Brush Drive-Through, with 2 vertical self-adjusting high-pressure spray manifolds. The HYBRID is capable of washing in a brush and touchless mode (in conjunction), or independently with brushes, or touchless. The HYBRID is an extremely versatile system that can wash your fleet comprised of mixed vehicles and configurations. Any part, crevice, or protrusion that the brushes cannot reach to wash with friction will be sprayed clean by the high-pressure spray arches. Manufactured with a hot-dipped galvanized framework, the system is configured with 2 or 4 full-length vertical brushes. These brushes are capable of washing the front, sides, and rear of the vehicle. The front and rear of the vehicle are scrubbed with the 2 vertical brushes, utilizing our industry exclusive overlapping brush movements. 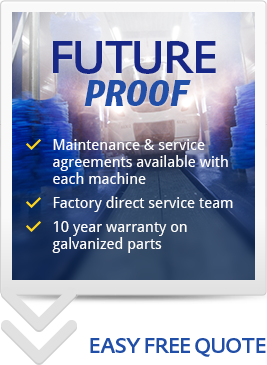 Wash bay space requirements/footprint can be drastically reduced by choosing a Westmatic wash system. This provides for new build cost savings and simple wash bay retro-fitting. The HYBRID system can be paired with a variety of our available options, making your next vehicle wash system the most versatile in the world! Click here if you would like to receive more information on our Hybrid Drive-Through.